History: (What If? II#40 (fb)) - At the beginning of the 1900s, the United States was ripe with drifters and other homeless with Boxcar Bertha claiming the title of "Queen of the Hobos" and the thief Jack Black going on to write a book about his survival. (What If? II#40 (fb)) - As a child, Ororo and her mother were buried under a collapsing building. While her mother perished, Ororo survived with claustrophobia. (What If? II#40 (fb)) - In recent years in Cairo, Egypt, Ororo (having becoming a thief to survive) attempted to pickpocket an honorable thief by the name of Herman Hassel. Recognizing her skills and feeling the need to teach his skills to another generation, Herman Hassel explained to Ororo the concept of honorable thieving and told her the stories of Boxcar Bertha and Jack Black. He then explained that he was about to return to his New York roots and then asked Ororo her name and where she was going. She claimed that her name was "Jack Black" and while she was originally going to Africa, she was now heading towards New York as well. Soon after, Ororo accompanied Hassel back to New York and began a life as an "honorable" thief, stealing people's wallets but always dropping them in a mailbox so the victim would get their IDs back. After one night of thieving, Ororo was attacked by a man who demanded the money she had just taken. Before she could become a victim herself, Ororo was saved by a prostitute named Marie but the both of them were soon arrested. Upon being sent to jail, Ororo's claustrophobia acted up and in an effort to free herself, her mutant powers first manifested themselves as a rainstorm within the jail cell. During the commotion, Ororo escaped with Marie and Herman Hassel, who had arrived to visit her. (What If? II#40) - Years later, Ororo had managed to control her powers, using them in her trade as a thief by short-circuiting security systems with lightning and flying via the winds she created. During one thieving trip, Ororo questioned her trade until a group of policemen found her and she attacked them to get away, claiming she was sorry. The next day, Marie asked Ororo if during that heist, she had found a giant red gem since everyone had been looking for it, even the mutant superheroes the X-Men. 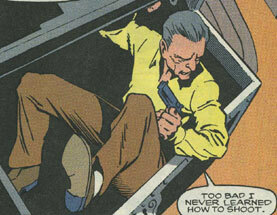 While Ororo and Marie were out, the X-Men searched Herman's room while he hid inside of a trunk. The X-Men found the gem and retrieved it, leaving Herman inside the trunk until Ororo and Marie returned. After hearing Herman's story of the X-Men, Ororo became determined to teach the X-Men a lesson for frightening Herman. She soon made her way to the X-Mansion, where she crashed through the front door and attacked Nightcrawler. A battle soon ensued between Ororo and the X-Men that was broken up by the arrival of Professor X, who explained why the gemstone was needed for the fate of the Earth. He then invited Ororo to stay and get to know the team, but she declined, claiming that she didn't belong in such a huge place that she didn't trust. She then made her leave of the Mansion and returned to Herman and Marie to say goodbye and find herself. When Marie asked where she would go, she replied that maybe she'd visit Africa. Not long after in Africa, Ororo seemed to find peace. Comments: Created by Ann Nocenti, Kirkowood Studios (Steve Carr & Deryl Skeleton), and Joe Rubinstein. This reality diverged when Ororo met Herman Hassel and decided not to visit Africa in favor of going to New York with him. Given the costumes worn by the X-Men during this story, I'd say the gemstone the X-Men were looking for was the one that housed the essence of Kulan Gath, seen in the X-Men books around issue #188-191 or so. Boxcar Bertha was a hobo living during the early 1900s. She fancied herself the "Queen of the Hobos" and her legend was told for generations with Herman Hassel telling Ororo of Bertha's life. Jack Black was a thief during the early 1900s who eventually wrote a book chronicling his life of survival. His legend was told generations later by Herman Hassel when he explained to a young Ororo about the concept of honorable thieves. After hearing the story, Ororo began using the name "Jack Black" as an alias. Colossus was a member of the X-Men and he was very similar to his Earth-616 counterpart up until he joined the other X-Men in searching Herman Hassel's room for a gemstone needed to save Earth. Thinking that the X-Men had come to scare Hassel, Ororo attacked the X-Mansion. 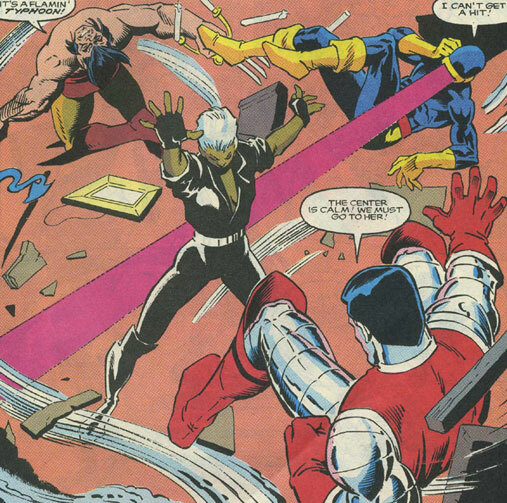 Colossus helped during the battle until it was broken up by the arrival of Professor X. After befriending Ororo, Colossus said his goodbyes to hear as she left the Mansion. 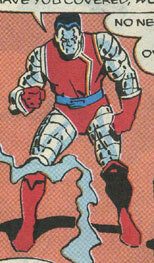 He had the same ability to transform into steel as his Earth-616 counterpart. Cyclops was similar to his Earth-616 counterpart up until he and the other X-Men searched the room of Herman Hassel for a gemstone needed to save Earth. Thinking that the X-Men had come to terrorize Hassel, Ororo attacked their Mansion. During the battle, Ororo trapped Cyclops within a cyclone but eventually stopped the battle when Professor X arrived. Explaining themselves, the X-Men and Ororo became friends and Cyclops was present when Ororo said her goodbyes. He had the same optic energy powers that his Earth-616 counterpart had. Herman Hassel was an elderly honorable thief who first met Ororo during his travels in Cairo, Egypt. She tried to pickpocket him and recognizing the trade, Hassel taught her about being honorable and told her the stories of Boxcar Bertha and Jack Black. Ororo claimed her name was Jack Black and decided to accompany him to New York where Hassel taught her even more of the trade until she was arrested and her mutant powers manifested. Years later, Ororo plundered a Mansion that housed a red gemstone that she gave to Hassel. 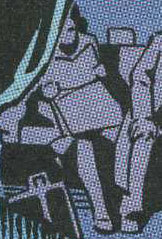 Soon after, the X-Men searched Hassel's room, scaring Hassel into hiding inside a trunk. Wolverine smelled Hassel inside but just laughed and said nothing was inside after Nightcrawler found the gem. In revenge for terrifying Hassel, Ororo attacked the X-Men until Professor X managed to calm her down and explain why they took the gem. Ororo made peace with the X-Men and returned to Hassel, only to reveal her real name and say goodbye, opting to travel to Africa. Marie was a prostitute who first met Ororo when Ororo was attacked in an alley and Marie saved her by hitting the attacker in the head with a broken beer bottle. Marie and Ororo were both arrested and Marie was present when Ororo's powers first manifested in the jail cell. Escaping, Marie joined Hassel and Ororo and years later, explained to Ororo who the X-Men were. After attacking and later making peace with the X-Men, Ororo returned to Hassel and Marie and said her goodbyes. Nightcrawler was very similar to his Earth-616 counterpart up until as a member of the X-Men, he searched Herman Hassel's room and found a gemstone that would save the Earth. When Ororo attacked the X-Men in retaliation, Nightcrawler was the first to try and talk sense into her. She managed to zap Nightcrawler with a lightning bolt but the battle was interrupted by Professor X. Making peace with the X-Men, Ororo said her goodbyes. 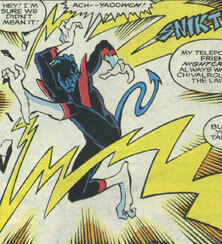 Nightcrawler had the same teleportational powers as his Earth-616 counterpart. Ororo was a young girl who was orphaned at an early age when a building collapsed on her and her mother. Surviving with claustrophobia, Ororo traveled to Egypt where she became a thief to survive. While trying to pickpocket Herman Hassel, she was discovered by him and taught in the way of an honorable thief. Deciding to travel with Hassel to New York, Ororo perfected her trade until she was arrested and put in jail. Her powers first manifested inside the cell due to her claustrophobia and she managed to escape with Hassel and Marie, a prostitute who had saved her life. Years later, she had learned to use her powers as a thief and when the X-Men stole a gemstone from Hassel that was given to him by Ororo, she attacked the X-Men until Professor X calmed her down and explained that the gem was crucial to save the Earth. Declining Xavier's invitation to stay with the X-Men, Ororo returned to Hassel and Marie, only to say goodbye and travel to Africa, where she seemingly found peace. Ororo had the same weather-manipulating abilities that her Earth-616 counterpart, Storm, possessed. 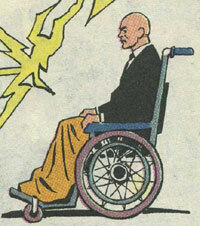 Professor X was the same as his Earth-616 counterpart up until he ordered the X-Men to invade Herman Hassel's room in search of a gemstone that would save the Earth. He stopped Ororo from attacking the X-Men in retaliation and explained who he was and what the X-Men stood for. He invited Ororo to stay with them, but she declined, claiming she didn't trust such a huge place. Professor X had the same telepathic abilities that his Earth-616 counterpart had. 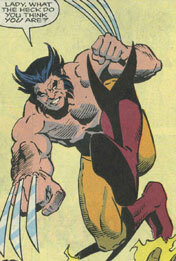 Wolverine was the same as his Earth-616 counterpart up until the X-Men searched Hassel's room. Wolverine smelled Herman inside the trunk, but laughingly told the other X-Men it was nothing. He later joined the other X-Men in defending the X-Mansion from an angry Ororo, where he was electrocuted through his adamantium skeleton. Surviving, he allowed Professor X to talk sense to Ororo and said goodbye to her after she declined to stay with them. He had the same adamantium skeleton, claws, and superhuman senses that his 616 counterpart had. The X-Men were the same as their Earth-616 counterparts up until Professor X ordered them to search Herman Hassel's room for a gemstone. Retrieving it, they returned to the X-Mansion where they were attacked by Ororo. Professor X calmed Ororo and invited her to stay, but she declined and said goodbye to the X-Men. 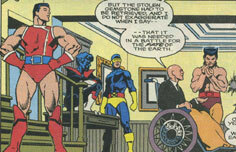 The team was (from left to right): Colossus, Nightcrawler, Cyclops, Professor X, and Wolverine.